The main public areas of the Metropolitan Opera House are now open free-of-charge to the public on weekdays from 10:00 a.m. to 2:00 p.m. and on Sundays from 11:00 a.m. to 4:00 p.m.. Visitors can walk up the grand staircase and see the famous starburst crystal chandeliers. There’s also a 50th anniversary exhibit in the lower lobby that features photos from the opera house’s construction, and footage from the opening 1966-67 opening season. There are rehearsals on the stage most days, so the main hall isn’t open to the public, but there is a large video monitor screen on which you can view what’s happening on the stage. Because of final dress rehearsals and other events, there will be no open public access on the following days: October 14, 25, 27, 28; November 1, 4, 10, 24, 28; December 2, 9, 16, 28, 29, 30;;January 6, 16, 30; February 2, 7, 13, 21; March 3, 13, 17, 19*, 27; April 10, 13, 21, 28. 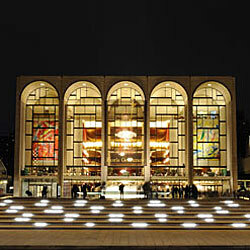 The Metropolitan Opera House is located in the Lincoln Center complex, at Columbus Avenue, between West 62nd and West 65th Streets. Map. These daily open houses are something new for the 2016/2017 Metropolitan Opera season. No word yet on if this will be continued in future years. 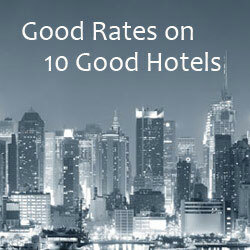 Please visit the Metropolitan Opera website for details. If you’d like to attend a performance of the Metropolitan Opera, there are several discount options available. Rush Tickets: A limited number of $25 same-day rush tickets are sold online daily. The rush tickets are sold on a first-come-first-served basis and go on sale at noon for Monday – Friday performances, at 2:00 for Saturday evening performances, and four hours before curtain for matinees. Purchase is limited to one pair of rush tickets per person. Details. 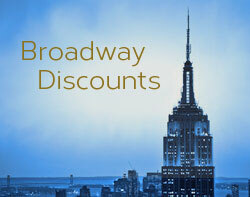 Discount Tickets: We have a list of discounted opera tickets available for purchase through Groupon and Goldstar. Ticket Office: For regular-priced tickets, visit the Metropolitan Opera website or visit the Met box office in person in the lobby of the Opera House. .